Seyal Fulka is a delicious breakfast dish from Sindhi. These are made with leftover chapatis and presented in a new way that makes it very interesting and exciting for the kids. I adapted this from Vaishali from where I first read about the different Seyal based dishes. There is Seyal Maani, Hara Samosa, and these Fulka. These were originally made from leftover chapatis, however, you can make with fresh ones as well. Though that was my original plan, with three different rotis planned on the same day, I just couldn’t make it. So I ended up making this dish with leftover Roghni Roti and Konda enjoyed it so much. This has got added to yet another dish I can make for her college. The spread is made with onion tomato base and applied on the roti. It is further cooked and folded. The final roti is crisp on the outside and soft inside. When I was I making the spread in the morning, I remembered that this is what we typically make for train journeys or even those nights when we feel bored to make the usual dinners. The tomato chutney is made and we all enjoy so much. We hardly make it now. And this reminded me of that. So this interesting Seyal Fulka is my S in the AtoZ Flatbread and More, where I am making AtoZ Indian Flatbreads. 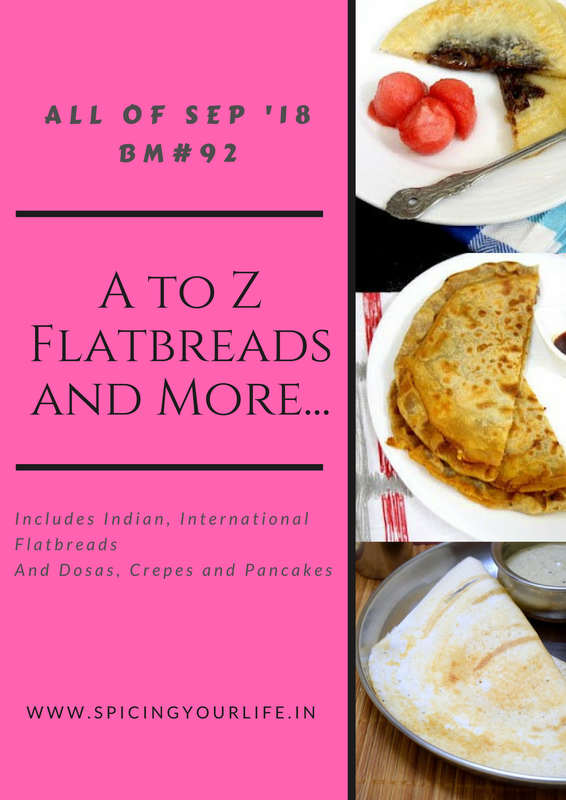 If you are interested to know what’s S in AtoZ Dosa Varieties, hop over! Saute the finely chopped onions, tomatoes along with all spices till it is well done. Add coriander leaves and remove. Heat a tawa and heat the rotis on both sides. Apply a tsp of spread over it. Fold it by half, spread the paste again and fold over again. Apply ghee and cook for 2 seconds. When I was making cvhapathis daily, which is a few years back, this onion tomato would be the side dish most of the time. They are such a delicious pair together. This version of cooking the chapathi with the chutney looks absolutely yum. That too with that soft roghni roti, this one is such an awesome treat. Glad you could use the Roghni roti for these , you anyways are a master at such plannings ! Really wonder how you manage ! But surely awesome Seyal fulkas ! Omg, this seyal fulka are calling me, i want to grab those absolutely irresistible fulkas rite now and have without any fuss. With those soft roghni roti am sure this seyal fulka will definitely please my hungry tummy. Drooling. Fantastic, Valli. Even now I make the onion-tomato sabji for my husband and I am sure he will love this seyal fulka as well. Love this stuffed bread with spices and tomato …. great option for breakfast with tea or coffee. These flukes with a lip smacking spread, I can have it any time. What a wonderful idea. Would also make a good option for a light dinner meal. Such a innovative use of leftover roti. Love the filling and it looks more like a pizza. I feel like just planning out the recipes take longer than the time we spend in cooking. Love this recipe to use the leftover rotis and no one will even complain. We cannot go wrong with the tomato onion filling. great use of leftover rotis. with this tomato chutney seyal phulka is so inviting. want to grab one, very tempting. such a lip-smacking fulka it is. Srivalli, I am seriously drooling just by reading the description if the dish! Such a tasty way to use up the extra chapathis! !